Seek defense representation immediately if you face a manslaughter charge. In Washington state, murdering happens when someone causes the unjustifiable death of another person without the intention to commit murder. 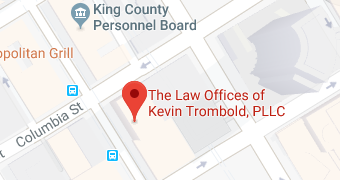 If you receive a charge of murdering in or near the Seattle area, immediately contact experienced Seattle manslaughter attorney Kevin Trombold. Answer no questions and speak to no one until you contact our Law Offices of Kevin Trombold. With over 20 years of experience representing defendants charged with voluntary manslaughter, negligent homicide, and similar violent felonies, Seattle manslaughter attorney Kevin Trombold knows what it takes to defend you aggressively against murdering charges and to advocate for justice on your behalf. The state of Washington recognizes different degrees of manslaughter based on the circumstances surrounding the offense. The consequences that you face will depend on which degree of manslaughter you have been charged with; first degree carries more severe consequences than second degree manslaughter. First degree manslaughter occurs when someone recklessly inflicts death of another person or unlawfully or intentionally kills an unborn child by inflicting harm upon the mother. In Washington state, the penalty for manslaughter in the first degree, is six-and-a-half to eight-and-a-half years in a state prison. Second degree manslaughter happens when someone acts with criminal negligence and this negligence leads to the death of another person. A conviction for manslaughter in the second degree, a class B felony, is punishable by 21 to 27 months in prison. If a manslaughter offense, either first or second degree, is committed with a firearm or a deadly weapon, the manslaughter sentence may be enhanced. If you are convicted of manslaughter, there are other penalties besides jail time and fines that you may face. The victim’s family may pursue a civil suit against you, which will be completely separate from the criminal court proceedings. If the court finds in favor of the victim’s family, you may be forced to pay large amounts of money to the family as compensation for the wrongful death you have caused. Even if you are found innocent in criminal court, a wrongful death lawsuit can still be brought against you in civil court. Family and friends may shut you out after a murdering conviction. It will likely be difficult for you to find a job with a murdering conviction on your record, since employers will be hesitant to hire someone who has showed reckless or negligent behavior in the past that has led to someone’s death. The same can be said for landlords, so you may have trouble finding housing with a manslaughter conviction on your record. Even though the consequences of murdering are severe, they are still less serious than the consequences of murder charges. For this reason, some defense attorneys who have clients facing murder charges will fight to have the charges reduced to manslaughter. This strategy is only done when the evidence against the client is overwhelming and the client is very likely to be convicted of any charges brought against him and her. Just because some clients fight to have murder charges reduced to manslaughter does not mean that manslaughter charges should be taken lightly. The consequences of a murdering conviction are very real—and very serious. Attorney Kevin Trombold is committed to providing every manslaughter client with a high-quality, aggressive, effective legal defense. He will investigate the crime, question the witnesses, examine the evidence, and work diligently to cast doubt on the prosecution’s case against you. Over the last two decades, Seattle defense attorney Kevin Trombold has prevailed on behalf of countless clients accused of violent crimes around the Seattle area. If someone you know, or you are accused of manslaughter or any crime of violence, make the call immediately. Part of the definition of first degree manslaughter is that the defendant must have acted with recklessness. How does the law define reckless behavior? A person is considered to be reckless when he or she knows of or disregards a substantial risk that a wrongful act may occur and this disregard constitutes a gross deviation from the standard of care that a reasonable person would exercise in the same situation. In order to be convicted of second degree manslaughter, the prosecution must show that you acted with criminal negligence. But, what exactly is criminal negligence? Criminal negligence is when a person fails to be aware of a substantial risk that a wrongful act may occur and his or her failure to be aware of this risk constitutes a gross deviation from the standard of care that a reasonable person would exercise in the same situation. Therefore, the difference between recklessness and criminal negligence is the person’s awareness of the present risk. To be reckless, the person must be aware of the risk and disregard it. But if the person was oblivious to the risk that should have been apparent, then it is considered criminal negligence and not recklessness. The murder law and the manslaughter law are the most serious laws enforced by the criminal justice system. Having this type of charge can harm your reputation, along with the rest of your life. Make sure you have an experienced criminal defense attorney like Kevin Trombold, or one of his staff on your side the entire time. Contact us at 206-382-9200 promptly no-cost consultation.